well today i was looking at my dominant hand and notice under my third finger i have an a star but what ive read usually a star is mark by a Astrix but i have a complete star does the carry the same meaning? jriver wrote: well today i was looking at my dominant hand and notice under my third finger i have an a star but what ive read usually a star is mark by a Astrix but i have a complete star does the carry the same meaning? If by 'star' you mean e lines that intersect creating six points, then it's considered a Gift marking called the Star of Apollo. If it's an "X" with four points, then it doesn't qualify as a Gift Marking. Both are about creative expression in teh big picture but they carry different aspects. How many lines intersect and how many points are created? I cropped the area that I think you are referring to in your palm. I can see the pattern you are asking about, I think. Maybe even two of them, one on top of the other? It is an interesting pattern but typically a star on this mount should be large and cover a good portion of the mount. I can't see the photo well enough to figure it out and when I take it another software program it just looks fuzzy when I zoom in. 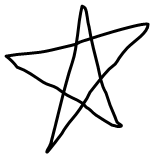 The * is what I'm looking for - 3 lines intersecting - to be a gift marking star. I don't agree with patti that it needs to cover a large part of the mound to qualify as a gift marking star. I've seen hundreds that are actually a bit small and only possible to see clearly with a magnifying glass. My experience is that if the lines are there, small or big, you are working with the energy of what is designed. The image I uploaded in my previous post is your right hand, but I now see are left handed. 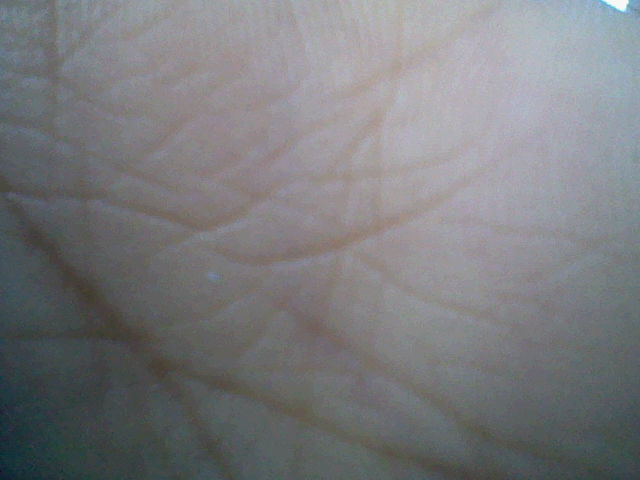 Is the most recent image of your left hand? Although they have a star configuration, I would actually call them grill patterns, they have vertical and horizontal creases crossing each other. In your hands the angles make them look like triangles or a hand drawn star shape. I would interpret these as showing that you may be sometimes too critical of yourself. This area relates to creativity and self expression. Criss crossing lines here can show that you expect too much of yourself and maybe add pressure to be perfect. You would place more demands or expectations of yourself than anyone else would even though you may think otherwise. I think since you are young, these creases will become clearer and more focused as you get older and become more decided and focused on where you place your creative energy. Since I don't particularly use 'gift markings' I don't see where we are in disagreement. In that perspective i.e. gift markings, I didn't know the size that would qualify, so thanks for sharing. Instead, I tend to think the depth and size of a marking is important. Shallow creases can disappear easily. You're welcome! 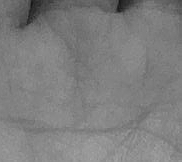 Maybe Pamelah can give you more information now that you've added a clearer image (of the correct hand). I agree with Patti about the vertical and horizontal lines criss-crossing and her interpreation. One additional comment about it - it's like saying 'yes,' then 'no'. The vertical lines are 'yes' lines where the horizontal lines are 'no' lines. So I'd suggest you pay attention to your mind chatter - how you talk to yourself, and how you get a great idea or inspired creative idea then talk yourself out of it. Maybe you can then start choosing thoughts that support your creative attempts and successes. I'm always open and interested in adding new tools to my hand reading tool box, but I have yet to find a 'packaged' system that encompasses all the information I have accumulated over the years. As we can read here, people are always pleased to know they have a 'gift marking' rather than not, but I also think people must have more than a just a marking that is 'special', they must also have the ability to use that gift in a way that benefits them. I totally agree Patti. One marking does not a hand make. It's the combination of markings that matters. Gift markings are one category. And by the way, it's not easy having gift markings so wishing for one isn't always easy. Pamelah wrote: I totally agree Patti. One marking does not a hand make. It's the combination of markings that matters. Gift markings are one category. And by the way, it's not easy having gift markings so wishing for one isn't always easy. Yes, I'm in agreement with you here, too! It's like what Magna said about the readings being holistic. And, also about what Stalin said in regards that you can't combine the features unless you have some information about the individual parts that you are combining. In that sense, I think of colors. Blue plus yellow is green, but blue plus red is purple etc. Layers of lenses - removing or adding any changes the hue, tint, shade or entire color. As for a Star pattern on the mount under the ring finger, I think it should be big, because I see it as including the 'passion line', a typical straight 'talent' line and an extra crease or two that crosses the former two to create an asterick formation. Smaller stars, I see them on people that have a high level of excitability depending on where found and how many.